You are currently browsing the category archive for the ‘holiday’ category. At my job (the tedious details of which I won’t go into for the sake of both myself and anyone reading this) I regularly have to ask customers to sign and date a variety of different forms. Many of these customers are from overseas, and usually pause for a few seconds before writing the date, unsure of whether to write it in their own country’s format or in the American style. There’s usually a four or five second pause in which they struggle to remember the current date while deciding which way to go about putting it down. When they do attempt to translate it to the American format (best known as MM-DD-YYYY), you can almost see the gears spinning in their travel-weary heads as they struggle to swap the numbers around from their traditional method (DD-MM-YYYY), every fiber fibre of their being resisting this action, a lifetime of calendar-reading and cheque-writing conditioning them to consider any alternative to their own way an outright perversion of nature. They pause, finally scratch out their half-written work, and write the date in their own format. I can’t really blame them. Putting myself in their shoes, I personally don’t know if I could ever fully accept having Christmas on 25 December, or recognize and mourn the infamous terrorist attacks of 11/9. And besides, I’ve always felt that we’ve been pointlessly out of step with the rest of the world in this regard anyway, once again adopting our own arbitrary standards and stubbornly sticking to them as an actual point of pride. So I was surprised to see that Japan follows the same date format as we do in America, generally notating dates by their month and day, respectively (February 9). This goes against the practice of Europe and most of the rest of the world, which list the day followed by the month (9 February). This brings together a really strange league of backwards nations, also composed of China, Canada, Philippines, Mongolia, and Kenya, along with a handful of European countries that seem to waffle between the two formats. This was an interesting discovery as I assumed that Japan would have sided with the DD-MM format, thereby dating the poster in the above picture as September 2. 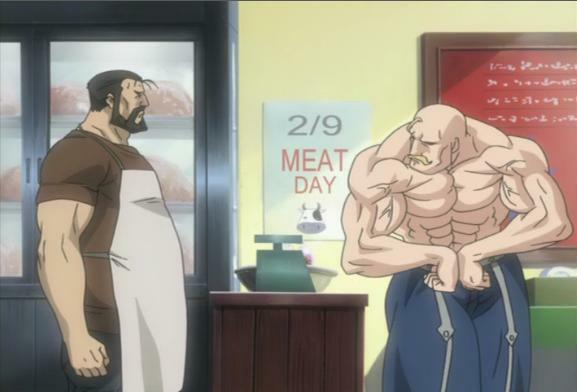 On the contrary, “Meat Day” in the world of Fullmetal Alchemist takes place on February 9. I was going to post this image simply for a laugh in a witty but subtle “check out my obscure and timely find” kind of way, until I actually looked in to it and had my mind unexpectedly blown. Abbreviate February 9 down to its shortest form and get 2/9. Translated in Japanese, 2 is pronounced as “ni,” and 9 as “ku.” Bringing these together gets you “niku,” which happens to be the Japanese word for meat. Yes, I realize that this is probably elementary Japanese to most anyone who’s taken the time to learn the basics of the language, so I’m not patting myself on the back for needing a Google search to help me connect the dots in this case. Nor have I been able to find out if it’s an actual holiday of sorts or just an opportunity for butcher shops to have special one-day sales. Nevertheless, Meat Day is here. What does this mean to you? That’s up to you to decide, just make it special in your own way!